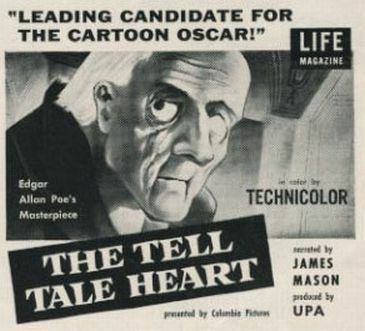 'The Tell-Tale Heart' is a 1953 animated short film directed by Ted Parmelee and narrated by James Mason based on the Edgar Allan Poe short-story. The film was the first cartoon to be rated X, indicating it was suitable only for adult audiences, by the British Board of Film Censors. It was nominated for the Academy Award for Best Animated Short Film but lost to Toot, Whistle, Plunk and Boom from Walt Disney Productions. In 1994, animation historian Jerry Beck surveyed 1000 people working in the animation industry and published the results in The 50 Greatest Cartoons: As Selected by 1,000 Animation Professionals, in which The Tell-Tale Heart ranked #24.